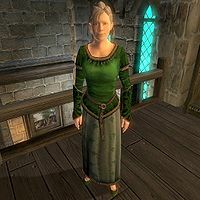 Matilde Petit, a Breton noble, is a guest at Summitmist Manor in Skingrad. Together with Dovesi Dran, Nels the Naughty, Neville, and Primo Antonius, she is involved in a private treasure hunt for a chest of gold, or so she believes. There is actually a Dark Brotherhood contract on her and the other guests, which will be given to you as the quest Whodunit?. Matilde claims her family is well-respected in High Rock, from where it hails. According to the other guests, she is rather arrogant, and they accuse her of being greedy, claiming her family is not as well-off as it is supposed to be, and therefore she is out for gold. She is also racist towards Dunmer and Nords, and so dislikes both Dovesi Dran and Nels the Naughty. Though she seems to hold Primo Antonius as somewhat of a peer, Primo looks down on her instead. It seems she only gets along with Neville, for whom she apparently holds romantic feelings. It is apparent that Redguards are subject to positive racism from her. It becomes apparent that while she acts as a helpless old lady, she can be quite cruel and mean-spirited, which can be discovered should you discuss the death of Dovesi with her. During Whodunit?, you'll be tasked to eliminate the whole party at Summitmist Manor, which includes Matilde. Ocheeva will reveal, "Each guest, at some point in the past, wronged their mysterious host. Now he's hired us to exact his revenge. ", though it is unknown what Matilde did to deserve this contract on her. I'm an assassin, hired to kill you. "Hahaha! Oh, you're a funny one! Good, I'm glad one of us has a sense of humor about all of this. It will make our time here that much more enjoyable." My baby is sick, and we are so poor. "Oh, you poor dear! Well, this does make things difficult for me. I want to find the gold as much as anyone, but you need it so much more than I do!" "Yes, well... Anyway... Now that we're all here, I guess we can start looking. I'd wish you good luck, but I wouldn't really mean it." She'll tell more about herself should you ask: "That's right. It's a Breton name. I'll have you know the Petits are one of High Rock's oldest and most respected noble families." You can also ask her about the other guests, to which she'll have different replies depending on her disposition towards you, which will be the case for most of the dialogue heard throughout the quest. "What about her? She's a Dark Elf, and that's bad enough. I may even like her less than you, if that's possible." "The little Dark Elf? She seems a nice enough girl. But to be perfectly honest, I've never trusted their kind." "Personally, I think she's a little floozy. She's been eyeing young Primo Antonius, probably smells his wealth." "He reminds me of you. Uncultured, unwashed and generally uninteresting." "He's a Nord. Mead-swilling barbarians, all of them." "Oh, that man disgusts me! I find his entire manner offensive. Why, just before you got here he told the most off-color joke about an Argonian maid." "What do you care? He seems like a very respectable person. That's more than I can say for you." "From what I gathered, he's a retired soldier. He's been all across the Empire fighting in various campaigns. Goodness, he's handsome...." "Well, if I can be perfectly honest with you, I find Neville quite attractive. Redguards are so... exotic. Don't you think?" "That young man has more nobility in his pinky finger than you have in your entire body, you uncultured swine." "He's young, well-educated and obviously full of himself. Not much different than any young nobleman, really." "It's obvious that young Primo comes from wealth. A chest full of gold would be mere spending change for him." "Oh, wonderful! This is going to be such fun! So, any ideas where we should begin searching first?" Try searching down in the basement. Ah... Not really. Search anywhere. I think I'll work by myself for now. "All right, dearie, I understand. If you change your mind, just let me know." If you accepted to work together with her, she'll consequently greet you with, "Oh, hello sweetie. So, no luck yet in finding the gold, I gather? I've been looking as well, but haven't found so much as a clue." The other guests also have their opinions of Matilde, and their responses also vary depending on their disposition towards you. "She's all right, I guess. Not that it's any business of yours." "Well, I don't really know her, but she seems like a very respectable old lady." "Honestly? I don't think she likes me. It's because I'm a Dunmer. I heard her say something to Neville, and it wasn't very nice." "I ain't got much to say about the old lady, and even if I did, I wouldn't say it to you." "Kind of stuck-up, that one. Right before you got here I told the funniest joke about an Argonian maid, and she didn't even crack a smile." "Heh, you should have seen the old biddy trying to talk to young Primo Antonius. She may be a noble, but he looked down on her like a scullery maid." "What's your interest in the old woman? You'd do well to keep your questions to yourself." "Matilde seems like an upstanding citizen of the Empire. She respects the law and recognizes the Legion as Tamriel's greatest defense against evil." "If I may be honest, I feel a bit sorry for the old woman. She comes from a noble family, I'm sure, but seems a lot less well off than she should be." "The old woman? I'd put her in the same class as you, actually - a peasant." "The old woman? She's quite a pest, really. I think she's gotten it into her head that I need mothering, or something. She is sorely mistaken." "Apparently the poor old woman thinks she is from a well-to-do family. Truth is, I have servants with more nobility in their blood than her." Once a guest has been eliminated, the atmosphere obviously changes, and so do the opinions of each guest. Matilde will greet you according to her disposition. A low one will grant you,"What do you want from me? For all I know, you could be the killer! ", a normal one, "Oh, this is just horrible! Who could do such a thing? Who could kill a defenseless person in cold blood? Greed truly brings out the worst in people. ", and a high one, "Please, sweetie, stay close to me. The killer might strike again, whoever he... or she... is." "Someone has been brutally murdered, yet you want to question me about that little Dark Elf tramp? Go away, you fool." "If you ask me, the Dark Elf is our killer. They're an evil and vengeful people, all of them." "That little tramp is as guilty as sin, you hear me? She's the killer, and if we don't keep our eyes on her she'll do it again!" "Even if I do think Nels is the killer, I wouldn't share my thoughts with the likes of you." "He's an obnoxious drunkard, I know, but I'm not sure if I see him as the murdering type." "You think Nels might be the killer? He plays the buffoon, but it could all be an act. He is a Nord, and they're such a savage, uncivilized people." "What, you don't think Neville is the killer, do you? That's absurd! He's a gentleman and a retired soldier, not a murderer!" "Neville used to be a soldier. I'm sticking close to him. He makes me feel safe." "Neville has a strong sense of justice, I can tell. If we find out who the killer is, he'll take care of things, if you know what I mean." "Someone turns up dead and you have nothing better to do than pester me about that fine young man? How truly pathetic you are." "Primo is a young man of refinement. This murder must be quite a shock for him." "I worry about the boy. What if the killer is after money? Primo is quite wealthy. He could be the next victim!" "So what are you trying to tell me? That Matilde is the killer? Why are you trying to turn me against her?" "Well, she does seem genuinely upset that someone's been killed. Not that I'm ruling her out as a suspect, mind you." "I don't trust that old hag. She pretends she likes you, and then stabs you in the back. Who knows. Maybe she'll REALLY stab you in the back." "Can't this wait, huh? Someone's been murdered and I've got better things to do than gossip about an old woman." "The old biddy seems flustered about the murder, but who isn't, right?" "It seems she's upset about the murder, but there's something else. It's almost like she's glad there's less competition for the gold. Greedy old bat." "She's upset, you idiot! Murder has that effect on people!" "The poor woman's rather upset. Someone of her bearing isn't accustomed to the horror of murder." "She's afraid, and for good reason. If the killer strikes again, they may very well pick an easy target, like Matilde. She needn't worry, though. I'm a trained soldier with over twenty years experience dealing with situations like this. On my honor, this killer will be caught and dealt with!" "Is there something wrong with you? Someone has been murdered! My feelings about that old crone are hardly important right now!" "Something tells me the murder of one of the guests isn't going to stop Matilde from searching for the money. She strikes me as the greedy type." "Now that someone's been killed, Matilde may be a little frightened for her own safety, but she's still more concerned with finding the hidden gold. Matilde claims to be from one of High Rock's most distinguished noble families, but I have a feeling their fortune has long been squandered." With tension now rising, it becomes more apparent that the supposed gold is just a hoax, and everyone suspects each other more and more. Matilde's fear grows stronger, and will now greet you with, "Two people are dead, and for all I know you could be the killer!" if she dislikes you, or with, "My goodness, two of us are now dead! What's going on in this place?" if she's indifferent, or with, "I've been trying to figure out who our host might be. With two people dead, it almost seems like he set this party up just to kill us all!" if she likes you. Her two main suspects remain Dovesi and Nels (and possibly you considering her disposition), while her trust towards Neville wanes. However, it becomes apparent that she cares more for Primo than she expressed before, and she does not suspect him the slightest. "She's a Dark Elf and a harlot, and for all I know she's a murderer too! Now leave me be, you cretin!" "Isn't it obvious? Two of us have been murdered in cold blood, and that little tramp hasn't batted an eyelash. You figure it out." "Don't trust her, sweetie. Not a thing she says. If she tries to get you alone anywhere, get away as fast as you can! She's a cold-blooded killer!" "Why are you trying to turn me against the Nord? Maybe you did [sic], and you're just trying to cover your tracks!" "Well, the list of suspects is certainly getting smaller. I didn't think the swine had it in him, but now I'm not so sure." "Two people dead, yet Nels still lives? I don't think that's a coincidence. Nords are savages, born to kill. I just know he did it!" "You're trying to turn me against him, aren't you? Just leave me alone!" "I just don't know what to think anymore, or who to trust. Neville seems like such a decent man, but how can I know for sure?." "Do... do you think he could have done it? I mean, he is a retired soldier. He's killed before. Oh, dear, this can't be happening!" "Two people lie dead, and all you can do is question me about that sweet boy? I'm beginning to think something is seriously wrong with you." "The poor lad is handling all of this better than I expected. It's a testament to his noble bearing, I'm sure." "If I may confide in you, dear friend, I'm very worried about the poor boy. The trauma of murders... it could scar him for life! He deserves better." Similarly, both Dovesi and Nels don't rule her out as the assassin. Primo is not impressed by Matilde's fear, only Neville seems to show compassion regardless of disposition. "Okay, so I don't like Matilde. What makes you think I like you any better?" "Could it be possible? Could an old lady be a murderer? She'd have the stomach for it, of that I'm sure." "At first I thought she was just a cranky old crone. Now I'm beginning to think she's a cold-blooded killer." "Have you no compassion? There are two bloody corpses lying in this place, and all you can do is question me about that old woman?" "She looks pretty shaken, doesn't she? I can't tell if it's genuine fear or just really good acting. She's as much a suspect as anyone, don't forget." "I'll be honest, friend. I don't know what to think about Matilde. Yeah, she seems frightened, but she's also still alive. Why wasn't she killed? She may look old and weak, but that's never stopped a murderer before, has it? Don't doubt for a second that she couldn't be the killer." "Excuse me? You want to question me about Matilde? Two people have been murdered, you fool! Get your priorities straight!" "Matilde is old, and frail. The shock of two people being murdered is surely too much for the poor woman." "There's a killer in here and Matilde needs protection. Who better to defend her but me? I'm keeping my eye on the old woman, don't you worry." "What are you doing? Trying to turn me against her? What's the matter, trying to cover your tracks?" "She seems frightened, like the rest of us. I bet now she's regretting ever stepping foot in this house, gold or no." "The more people that drop dead, the more annoying Matilde becomes. She keeps watching over me like some kind of worried grandmother. If the killer strikes again, maybe they'll do me a favor and take her out next." With only two targets left, there are now only two possible suspects: the other guest, or you. Matilde's fear has grown tremendously, as she'll greet you with, "Gasp! Oh... oh, it's you. What do you want? Why are you looking at me that way?" if she has a low disposition, or "Gasp! Oh... oh. I'm sorry. I... my nerves. I just want to get out of here. Three people have been murdered! I'm so very frightened!" with a normal disposition, or with "Gasp! Oh, thank goodness it's you, sweetie! Please, don't wander too far away. I feel safe with you." if she has a high disposition. If Dovesi is the other guest, she won't suspect you to be the killer, and may even end the conversation to attack her if you mention Dovesi with a high disposition. The same would go for Nels, though she won't attack him. If Neville is the other guest remaining, she may suspect both you and Neville. Even Primo would become the suspect if her disposition is high enough towards you. "You bloody half-wit! Do I have to spell it out for you? She's a killer! A murderer!" "I knew it! It's her! That Dark Elf tramp killed them all! We've got to get out of this place!" "It's up to us now, don't you see? Dovesi did it! She murdered everyone! And now she wants to murder us too! We have to get her first!" "My feelings about the Nord are my own business! Leave me be!" "You and Nels... both still alive. One of you is a cold-blooded killer! I... I never did trust that Nord...." "Oh, please! Save me! Save me from that savage! He'll kill me and then feast on my flesh! That's what Nords do! Please, I don't want to die!" "You want me to mistrust him, don't you! You want to turn me against him! Maybe... maybe you're the murderer!" "I'm no murderer, so that means it's either you or Neville. Just stay away from me! I don't trust either one of you!" "I know you're no killer. That means it's Neville! Oh, I'm so frightened! Please protect me from him!" "You... you're trying to turn me against that sweet boy. Make me think he's the murderer! Get away from me, you fiend!" "There are only three of us left. All those people... dead. And the killer had to be either Primo... or you!" "Oh, my heavens! Primo must be the killer! I... I never thought it could be him. Please... please! You've got to protect me from him!" Interestingly, all other guests would at this point attack her if you mention Matilde with a high enough disposition, believing her to be the killer. "So you're telling me I should believe you? That Matilde is the killer? Why should I trust you? Get away from me!" "I have no doubt that Matilde is capable of murder. But what about you? You're as much suspect in my eyes as she is." "It's her, you understand me? It's Matilde! She's the killer! She's the one doing this! We've got to kill her first! Do you understand me?" "What, you think the old woman is the killer, is that it? Is that what you'd have me believe? Trying to cover your tracks?" "She's either a frightened old woman or a cold-blooded killer! I don't know whether I should comfort her or hit her over the head with a rock!" "There are only three of us left! You and I are no killers, so that leaves the old woman! Don't be fooled by her appearance. Matilde is no weakling. She killed the others in cold blood, and she'll try to kill us next! I'm not about to stand around waiting to die! We need to kill Matilde!" "I suppose you're trying to turn me against Matilde, eh? Make me think she's the killer. I've got news for you friend -- I know it's you! I can't prove it yet, but just you wait. You try to hurt that poor old woman and I'll cut you in two!" "Three people have been killed, and now Matilde thinks she's next. I guess only the killer knows for sure. Isn't that right?" "Three people have been killed, and the only ones left are you, me and a little old lady. One of us is a murderer, and my money's on the old lady. Don't let her looks deceive you, friend. I've seen black widows like her before! Her crimes must not go unpunished! Justice is at hand!" "What, are you telling me Matilde is the killer? I don't know what to believe! You just stay away from me!" "At first I thought Matilde was just a cloying old hag, but now I realize she could be the killer!" "It's her! Don't you see? She's the only one left! The only one left alive! We've got to get her before she can get us! Do you understand?" Provided she's not the only target left alive, Matilde will discuss the deceased guests throughout the quest, as will the other guests should she perish. "So she's dead. What do you want from me? Flowers? A eulogy? I think not." "Yes, the poor girl is dead. What a shame. Well, I guess she won't be finding the gold, hmm? Hehehehehe." "One less Dark Elf in the world. And now there's one less person to find the gold, as well. It's a good day, don't you think?" "He was a buffoon, but I didn't wish him dead, you cold-hearted villain!" "All right, so I didn't care much for the man. That doesn't mean I wanted him dead." "So, Nels is dead. I don't condone murder, of course, but I can't say he'll be missed. As a rule, I find Nords rather... vulgar." "He's dead, and one of you killed him! I hate you all!" "I... I can't believe he's dead. Such a strong, handsome man..." "Why would one of us kill Neville? What if they try to get the rest of us? You'll protect me, won't you?" "Leave me alone, you ghoul! Can't you see I'm mourning for that poor, sweet boy?" "He was so young... so innocent. That boy was destined for greatness. Who could have done such a thing?" "I just can't believe he's dead. He was like a young, beautiful prince. I hope whoever did this can live with themselves." "I... I never trusted her. But I never wanted to see her dead. Have you no compassion at all?" "It's hard to believe she's dead. Why would someone want to murder an old woman?" "Good, I'm glad she's dead. I can tell you that because we're friends. Matilde didn't like me just because I'm a Dunmer. She got what she deserved." "She's dead. You wouldn't happen to know anything about that, now would you?" "What kind of sick, demented person could cut down an old woman in cold blood? It proves that evil truly does exist in this world." "Some bloodthirsty monster killed that woman in cold blood. It's obvious to me one of the other guests killed her to eliminate the competition. Assuming that's true, who's next? You? Me? We need to keep our eyes open, friend. And we'd do well not to trust the others." "Someone slaughtered that poor old woman like a lamb. I've got my eyes on you. Make one false move and I'll come down on you like a hammer." "How could this happen? How could I have let my guard down. That poor old woman is dead, and I should have protected her...." "Matilde's murder saddens me friend, but not for the reason you may think. Ten years ago, when I was in my prime, this never would have happened. But now I'm old, and my instincts have failed. I let that woman down." "No, I didn't really care for her, you commoner scum, but I never wanted anything like this to happen to her!" "The old woman is dead! Murdered! Cut down in this very house! But why? Did she find the gold, and someone wanted it for their own?" "Between you and me, I think Matilde found the gold, and one of the others killed her for it! Maybe that means the rest of us are safe. If that's the case then the killer got what he was after, and the rest of us needn't worry about our own safety." If Matilde is your last target left, however, her fear will have come to a climax and she'll refuse to talk to you. Once again, her disposition will affect the way she greets you. With a low disposition, she'll assume you're the killer and will defend herself from you: "Aggh! They're dead! All dead! And you... you're the only one left. It's you! Oh, gracious, no! Stay away from me!" She won't suspect you otherwise, with a normal disposition, she'll say, "Aggh! They're dead! All of them, dead! Why? What's going on here? We need to get out of this place!" A high one will net you, "We've got to get out of here! You understand me? We're the only ones left! We need to find a way out of this house! Come on!" This page was last modified on 3 February 2019, at 02:39.